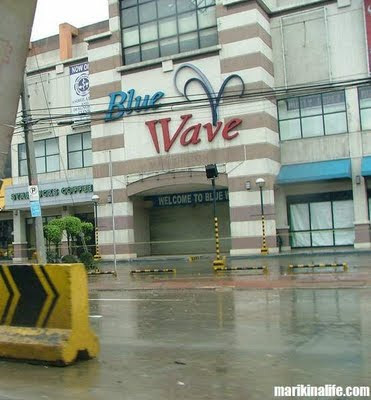 Both Bluewave Marquinton and Bluewave Robinsons along Sumulong Highway were both submerged in water during the sudden floods brought about by Typhoon Ondoy. This is the first time that the mall and supermarket have been directly affected by floods. Several stores located on the ground floor of both buildings were severely affected. Bluewave Marquinton ground floor stores and restaurants include Max's Chicken, KFC, Yellow Cab, Starbucks, Shakeys, Jollibee, Ministop, Tapa King, Pan de Manila and Watsons. Aside from the supermarket at Robinsons Bluewave, it also caters to Mercury Drug, Joey Pepperoni, Rai-Rai Ken, Binalot and Mr. Quickie. The supermarket would have been a crucial place for Marikina residents to buy food and items needed after the typhoon. Unfortunately, the supermarket fell victim to the floods as well. We're hoping that the Bluewave Marquinton mall resumes operations as soon as possible.